With their cabbage-like qualities and fabulous flavor, it’s a wonder that Brussels sprouts haven’t become a staple with current Chinese cuisine. In a large glass bowl, whisk together egg white, sherry, cornstarch and salt. Stir in chicken, cover and refrigerate at least 2-24 hours. Place two pots of water (one for chicken, one for vegetables) on stove over medium-high flame. When first pot is nearing a simmer, gently rinse the marinade off of the chicken and stir chicken into hot water, separating the pieces and allowing chicken to poach for about a minute (chicken will not be fully cooked). Drain chicken and set aside. When second pot of water is boiling rapidly, add carrots and cook for 15 seconds. Use a slotted spoon to remove carrot slices and set aside. Place sprout quarters in boiling water and cook for two minutes. Drain and set aside. Heat oil over medium heat in large frying pan or wok. Add garlic, ginger, green onion and red bell pepper. Stir-fry for about 30 seconds. Add blanched carrots and Brussels sprouts. Stir-fry 2 more minutes. Dissolve cornstarch in chicken stock, vinegar and soy sauce and add to pan along with chicken. 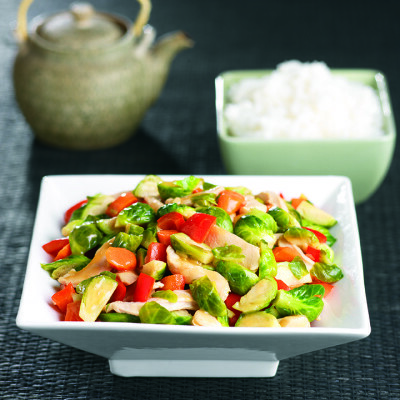 Stir-fry for about a minute or until sauce is thick and glossy and chicken is cooked through. Serve over rice.